Are you dissatisfied with the current state of the "government"? Thinking about becoming more politically active? 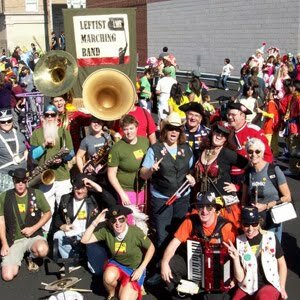 Why not join a progressive marching band? Former marching band players should find the LMB to be a great way to recapture the camaraderie and enjoyment of the marching band experience. For musically-challenged activists, the LMB flag corps and twirlers offer ways to get into the game. Dancers, jugglers, puppeteers, and any other performers are encouraged to participate. We will make a place in the band for anyone willing to rehearse and show up to play. To determine if the LMB is right for you, read more about the Band Charter listed below. and to produce a joyous sound and spectacle no one person could create. All are welcome and a place will be found for all. Let flexibility be a focus, so that we may enjoy without being burdened. No one will have to play a gig which they do not wish to play. A quorum for any performance will be established and agreed upon. If enough players are there, we will play. Gigs will be chosen by group consensus. As a marching band, we are by definition acoustic. Amplifiers and PA's shall not be used. Side projects are encouraged. As a marching band, we are by definition mobile. Music direction will be by consensus. Let us sing as well as play, and be a chorus as well as a band. If you are interested in joining the LMB, please click here and tell us a little about yourself. or how else you'd like to participate in an LMB performance.